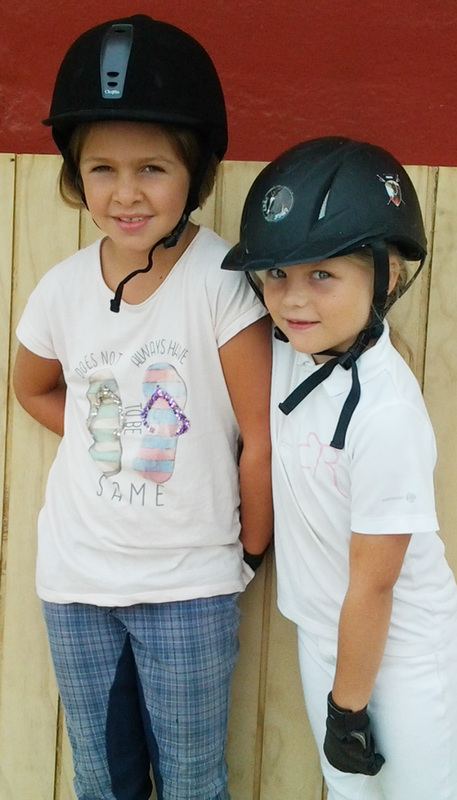 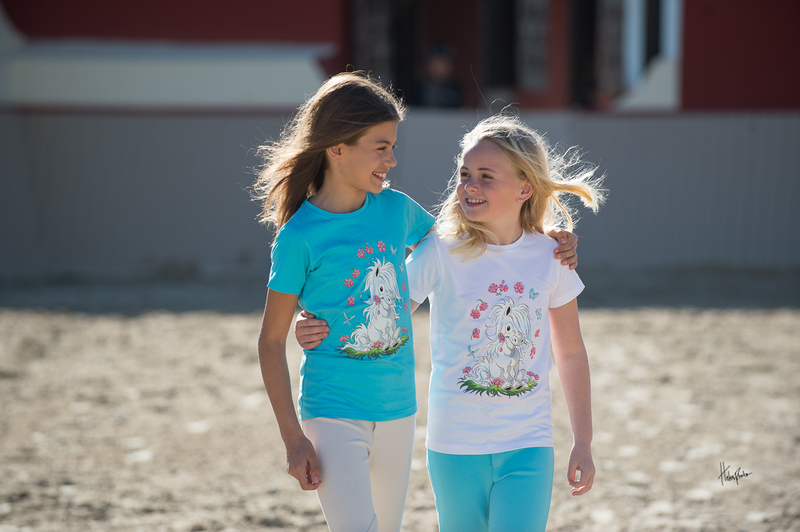 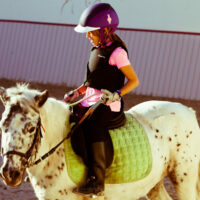 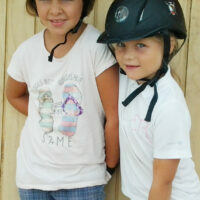 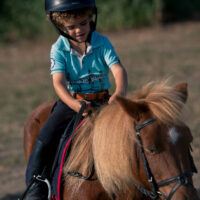 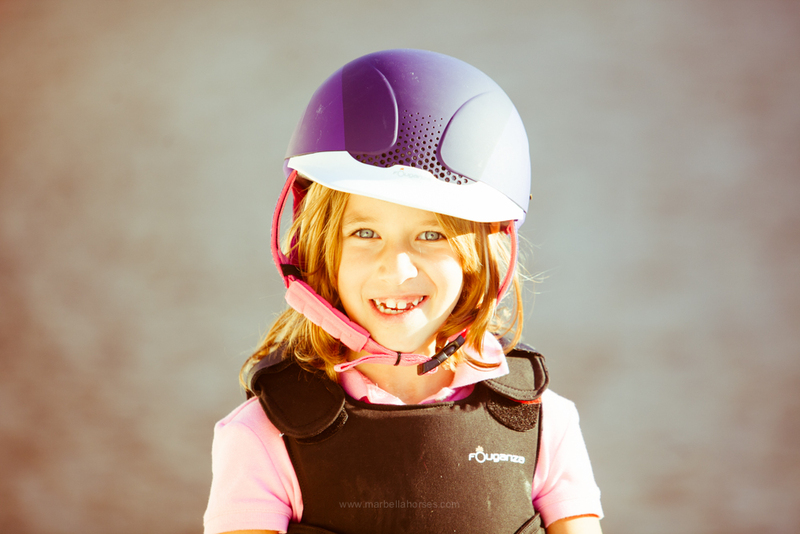 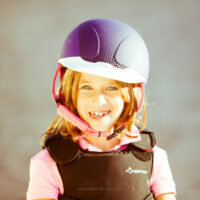 Riding is an enriching and very attractive sport for children. 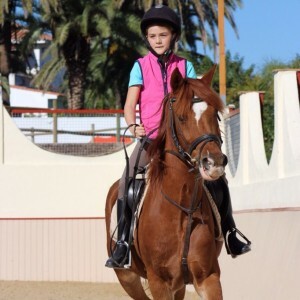 It is pleasant because it is practiced in a natural environment, outdoors and in contact with another living being, as noble and beautiful as the horse. 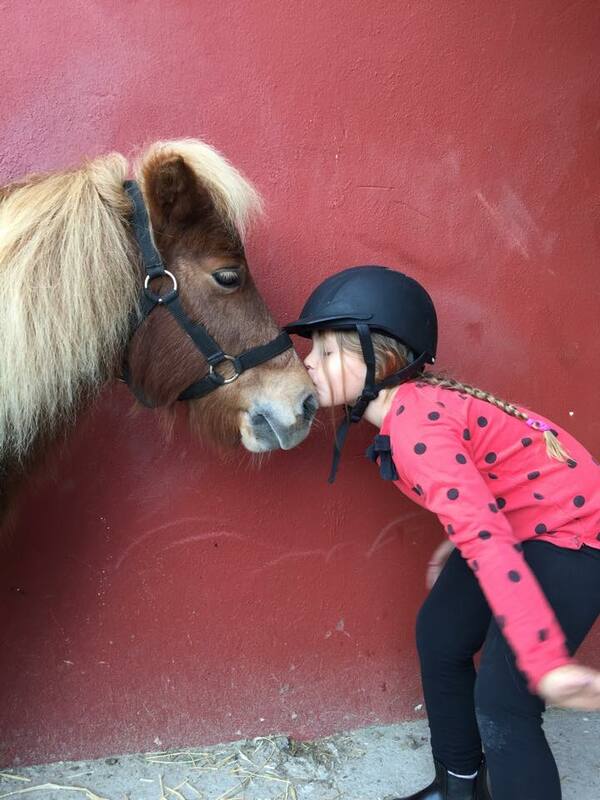 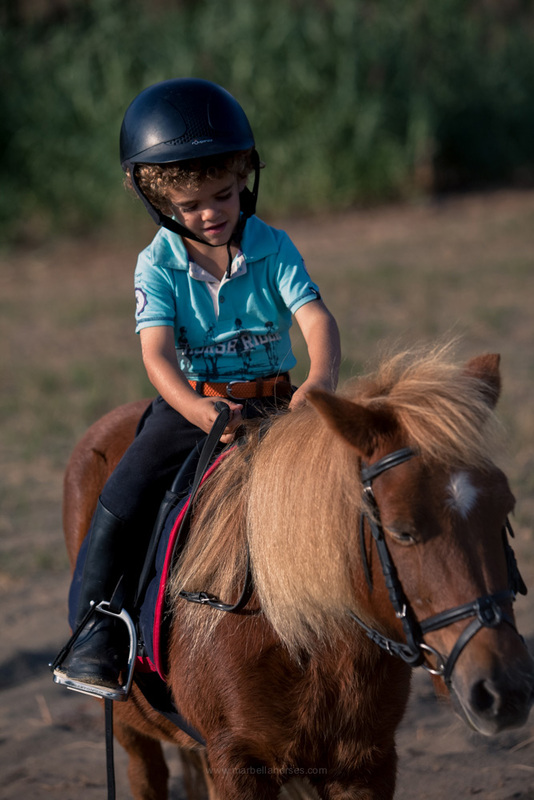 A pony, by its character and unique dimensions, permits children to learn and practise this sport in a manner which is safe and promotes human values such as confidence, temperament and satisfaction for a job well done. 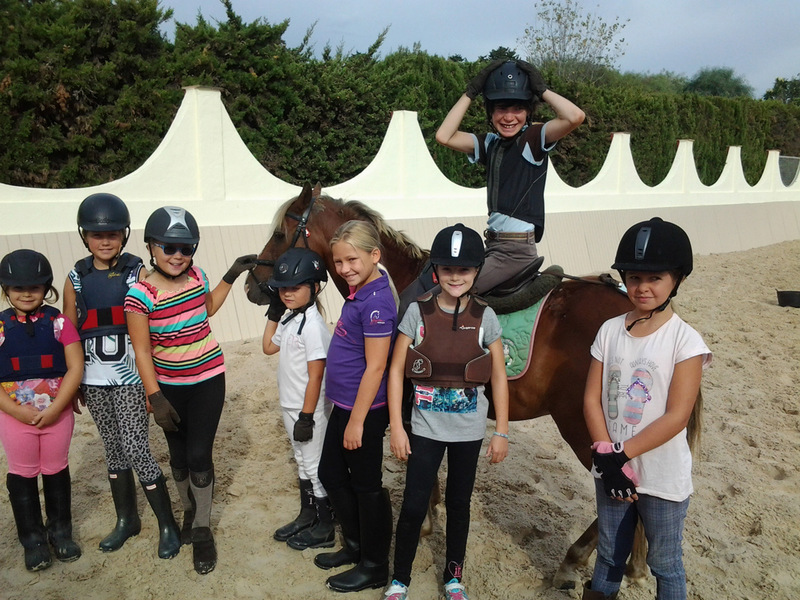 In the pony club we offer a choice of possibilities within the equestrian discipline, such as lessons full of fun and games that will help to develop team work and the desire to do better with every visit. 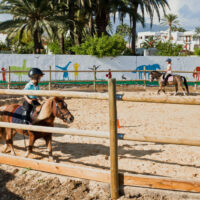 It is this need for adaptation which inputs to the equestrian practice different effects; shy children will gradually gain confidence in themselves; gentle children will have to prove their authority to be obeyed by their mount; The overconfident child who believes to know what is to be done will learn to moderate his manner; indolent children will learn to take action and improve their communication skills; the child with negative tendencies and feels contrary to most things will have to learn that pony doesn´t grant wishes like an adult…. 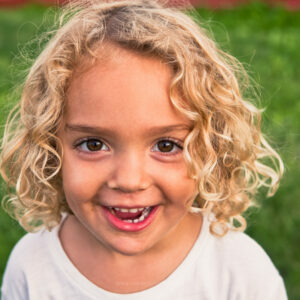 in short, it is a blue print to life itself. 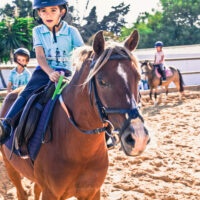 For our riding school we have developed a program of theoretical/practical education which is divided into three levels; Beginners, intermediate and advanced level. 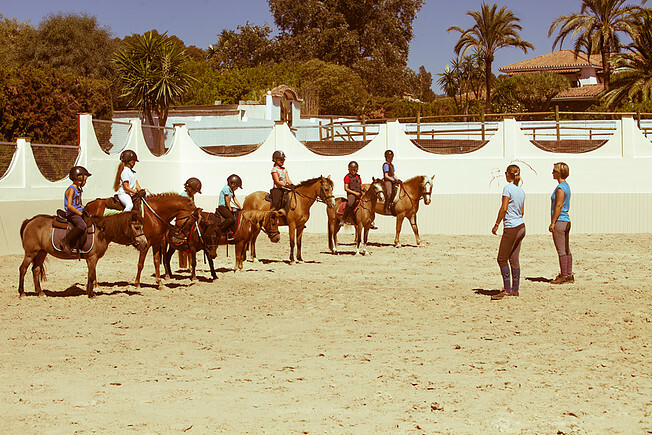 We will indicate the goals and the dates for achieving them. 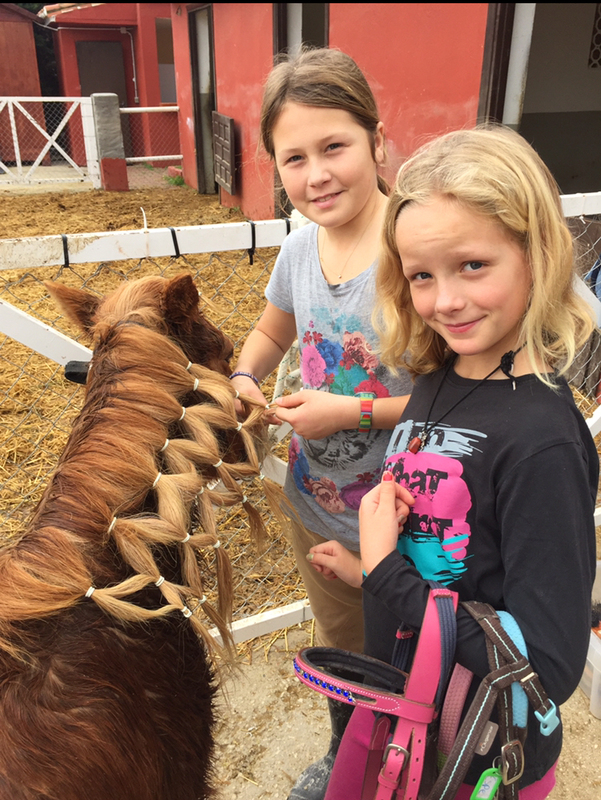 The handling and care of the pony will also be a part of their learning. 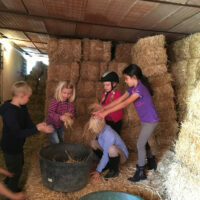 Setting goals is essential for the proper development of the student’s training and for maintaining a high motivation. 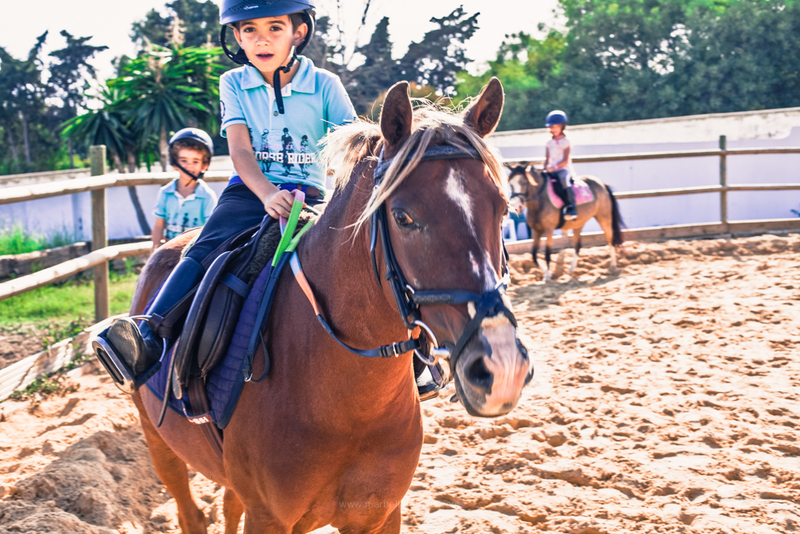 Therefore we prepare our students to take part in events, gymkhanas and competitions of different categories according to their age and level, never forgetting that the spirit of partnership must prevail at all times. 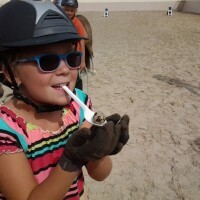 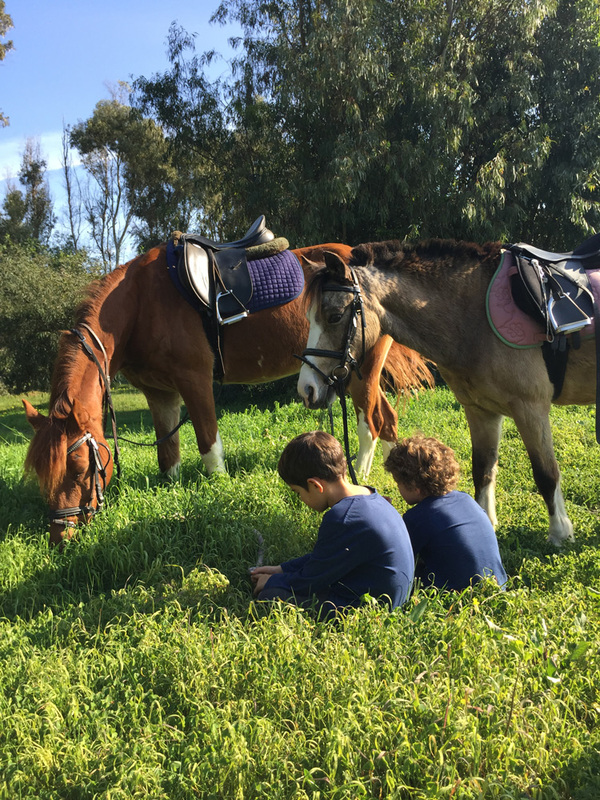 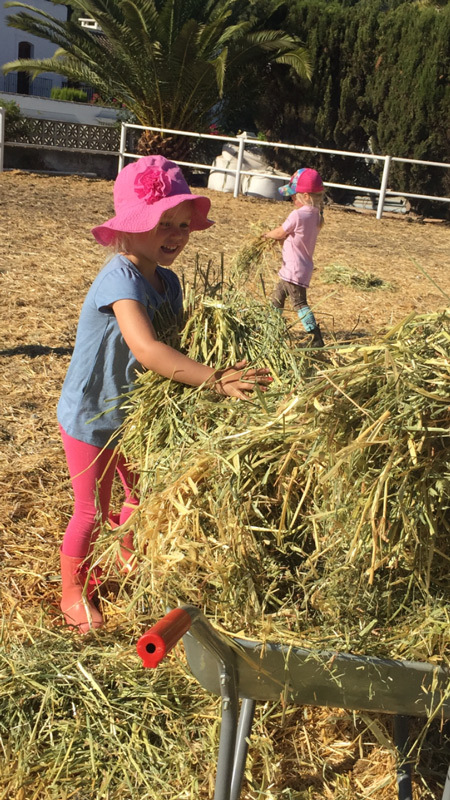 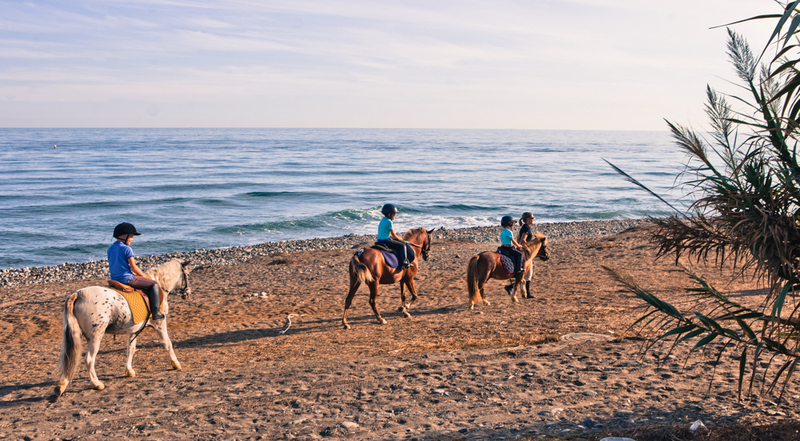 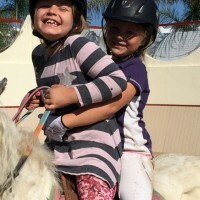 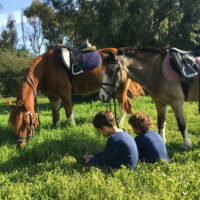 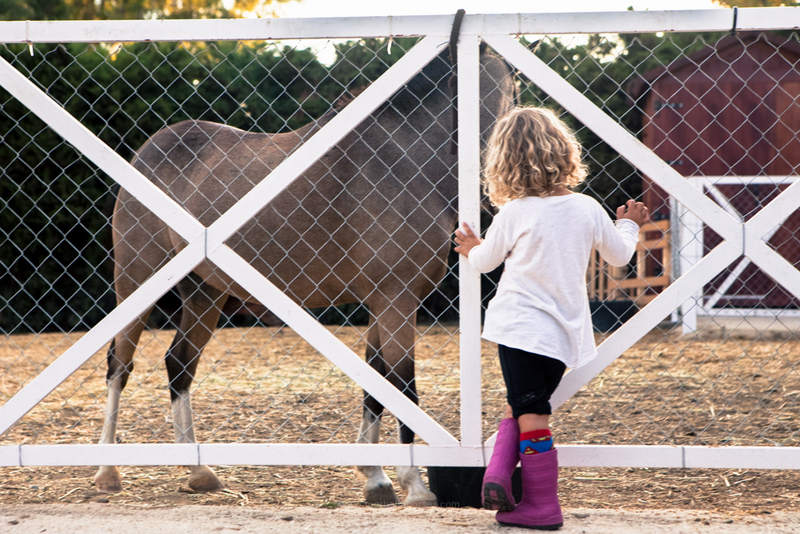 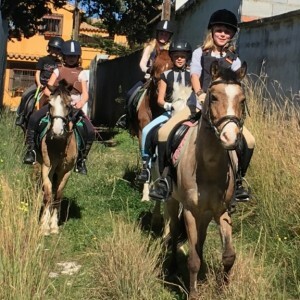 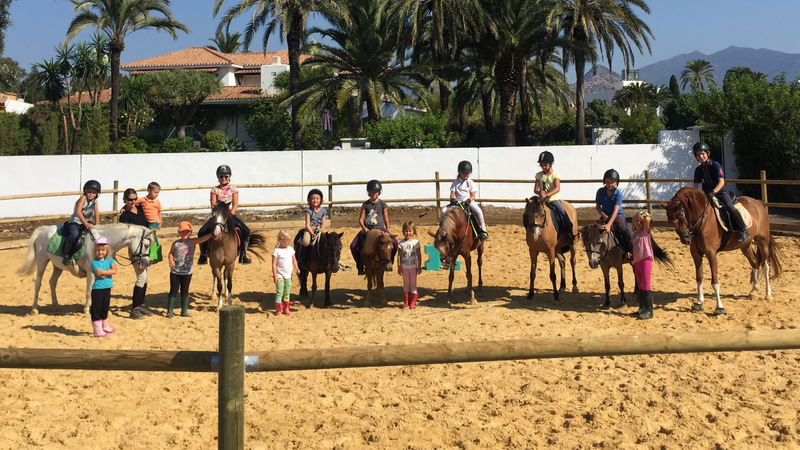 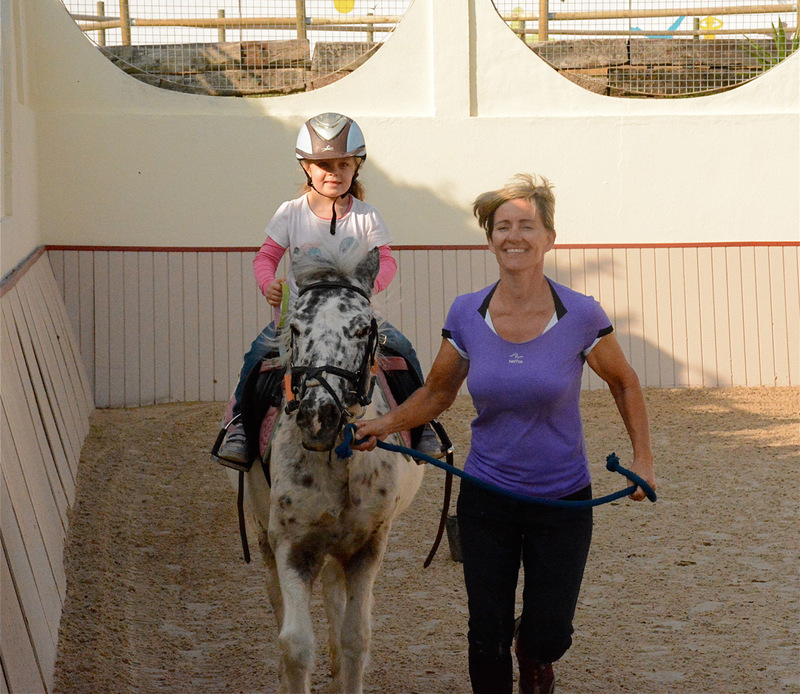 In our camps, in addition to riding lessons and walks along the beach, children are able to enjoy our ponies to the fullest and learn how to care for them which is an extremely important and rewarding aspect of our sport. 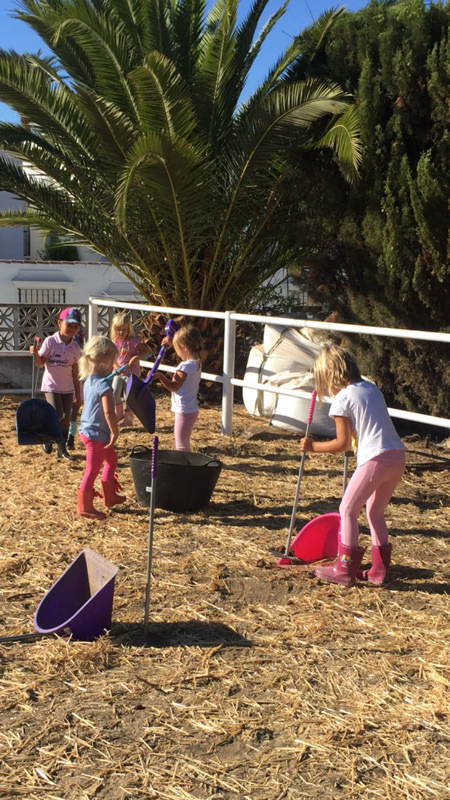 We also dedicate time to caring for our chickens, rabbits and organic garden –all of this through active participation of the children. 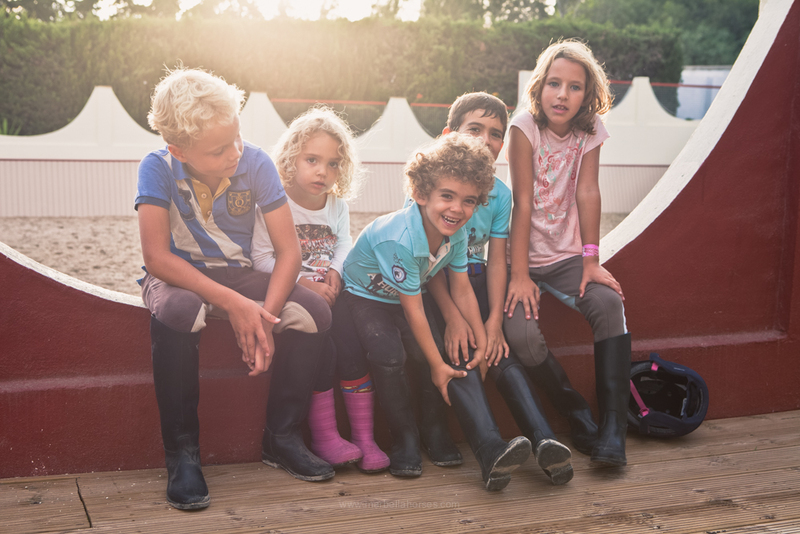 Joining the camps helps children to make new friends, engage in new conversations and share not only a daily routine, but also a broad range of activities. 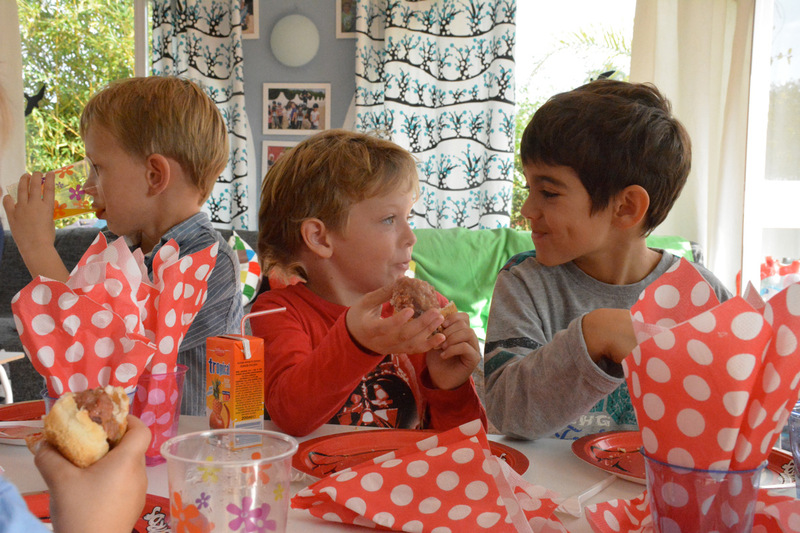 Team work and mutual respect are important values that will accompany them throughout their lives. 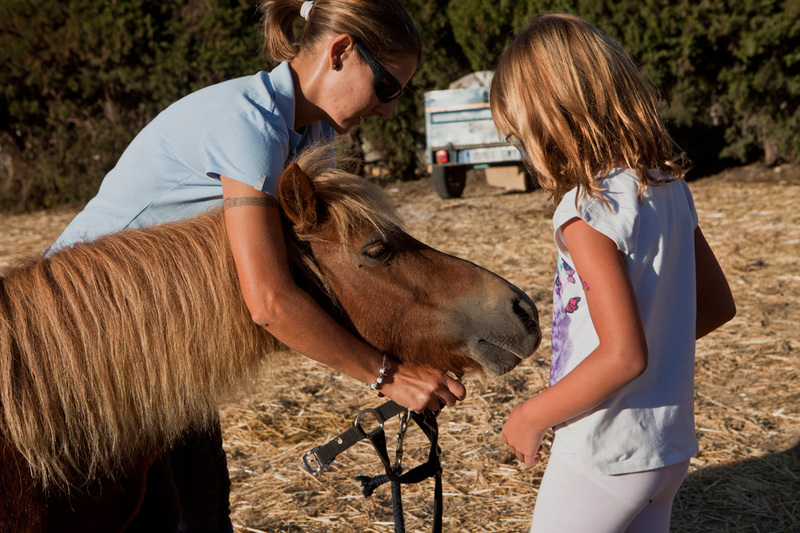 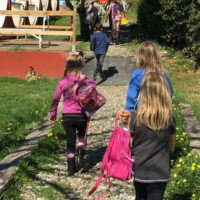 The Camps also come with educational content that is intended to bring children closer to nature and encourage them to establish bonds with the ponies and their environment. 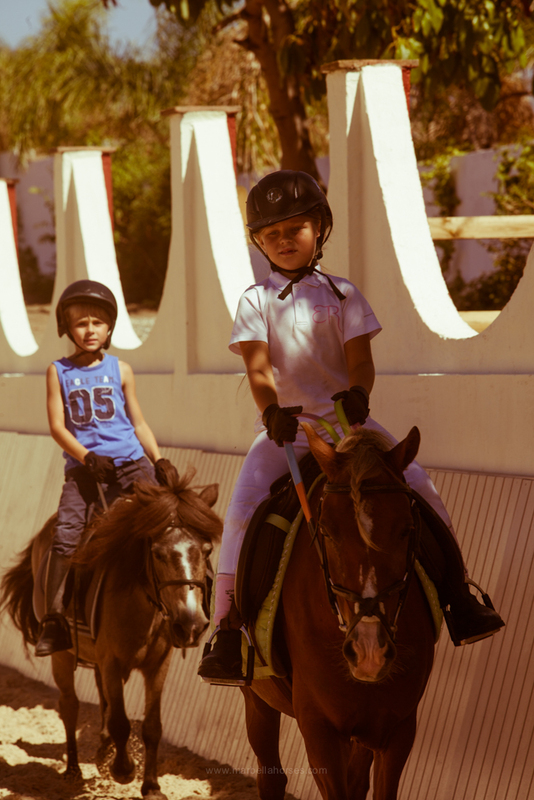 Our Camps take place Monday to Friday, from 10.00 to 14.00 during school holidays. 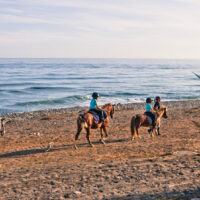 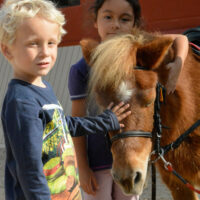 Children can also enjoy lovely walks along the sandy beach with our experienced Shetland ponies. 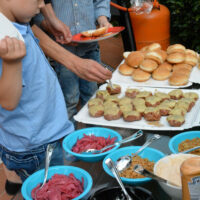 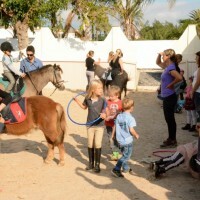 Parents can accompany their children on these outings if they so wish. 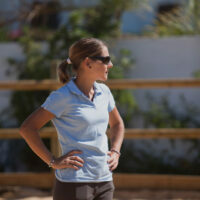 However, the activity is always monitored by a member of our staff. 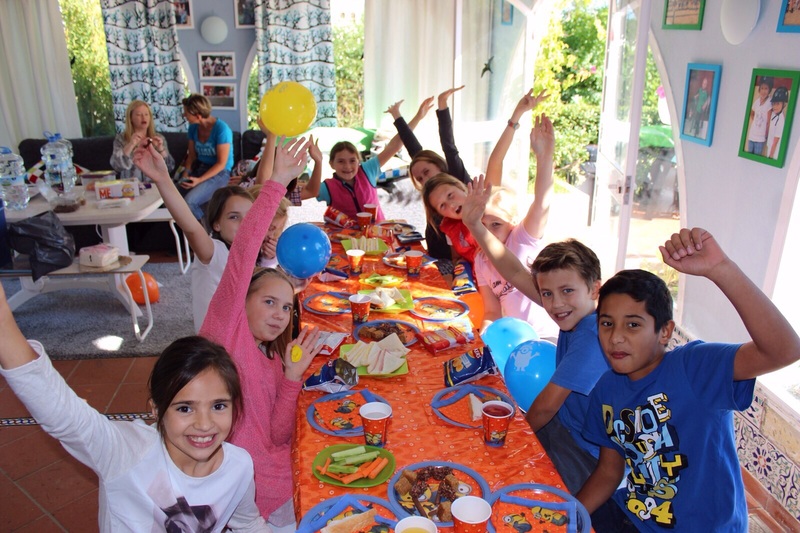 Celebrations are another important aspect of our activities. 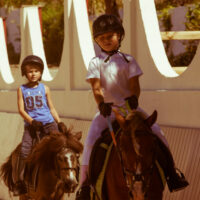 We organise gymkhanas and riding games for the children with our ponies. 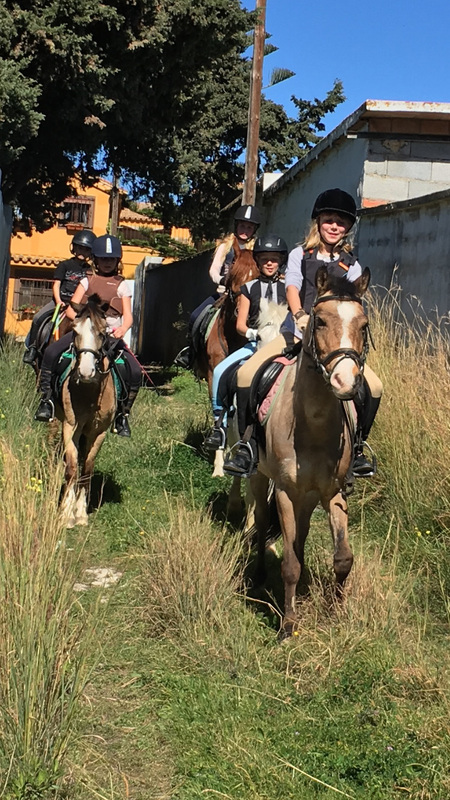 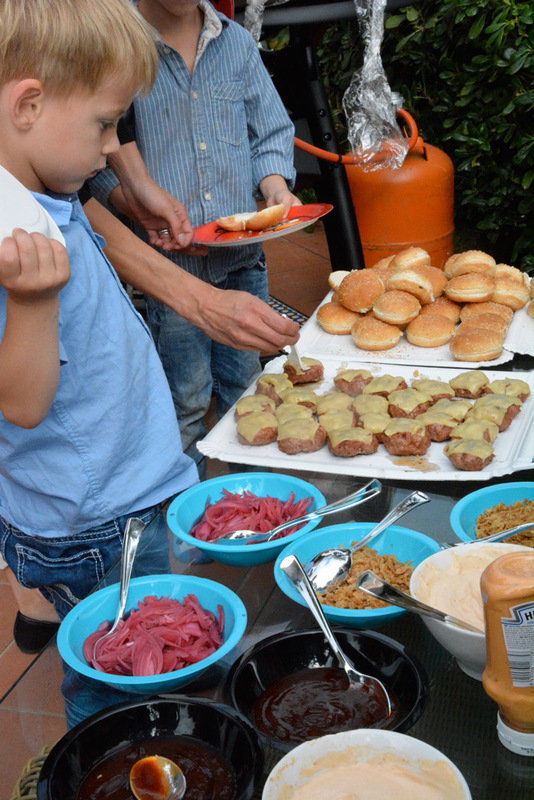 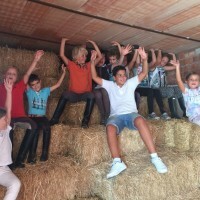 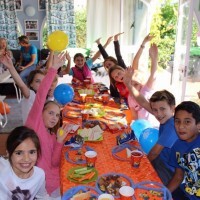 Villa Mimosa is an old and charming house which is adjacent to the stables, with gardens, barbecue area, trampolines and small farm animals as well as a celebration room and mini disco. 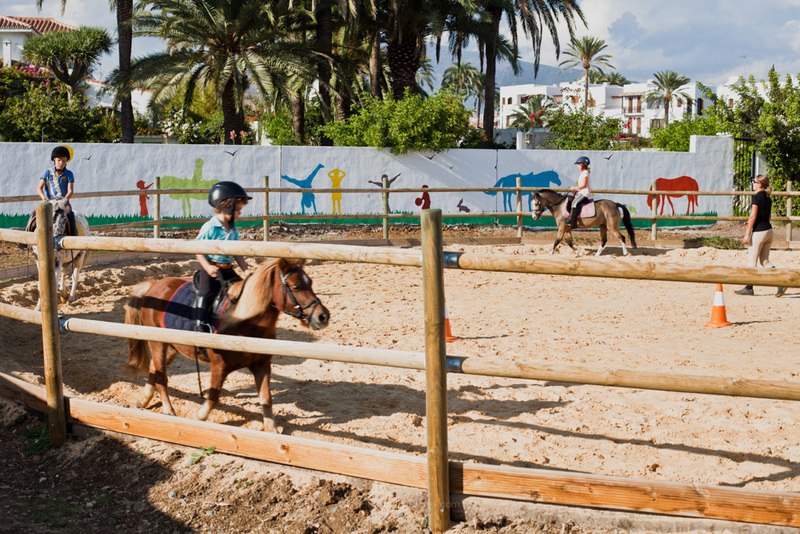 Children can enjoy time In Here either before or after the riding activities. 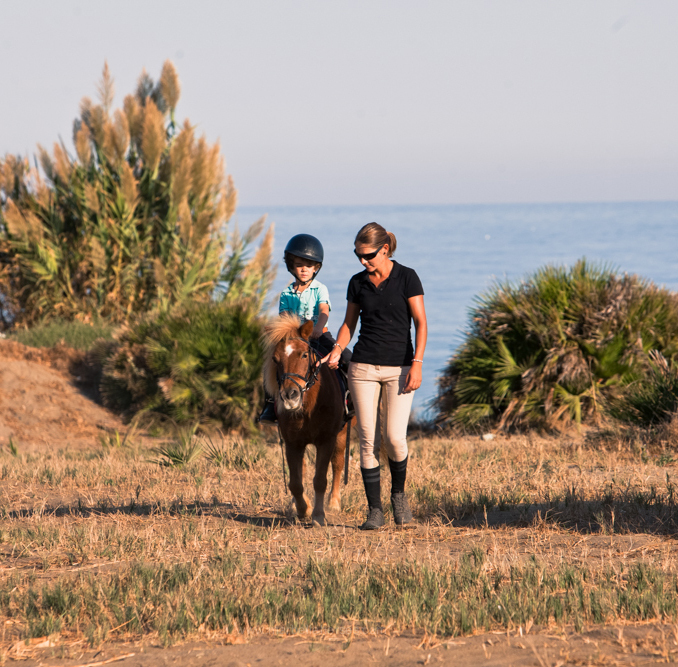 Located only 100 metres from the beach, This property has natural surroundings and is just 5 minutes drive from Estepona and San Pedro. 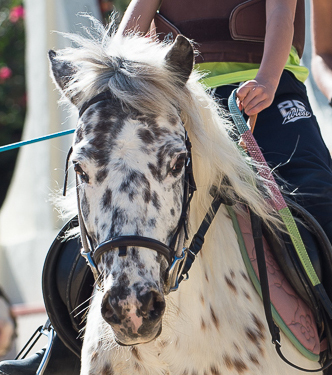 Come and discover an unforgettable experience! 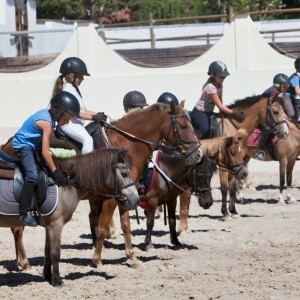 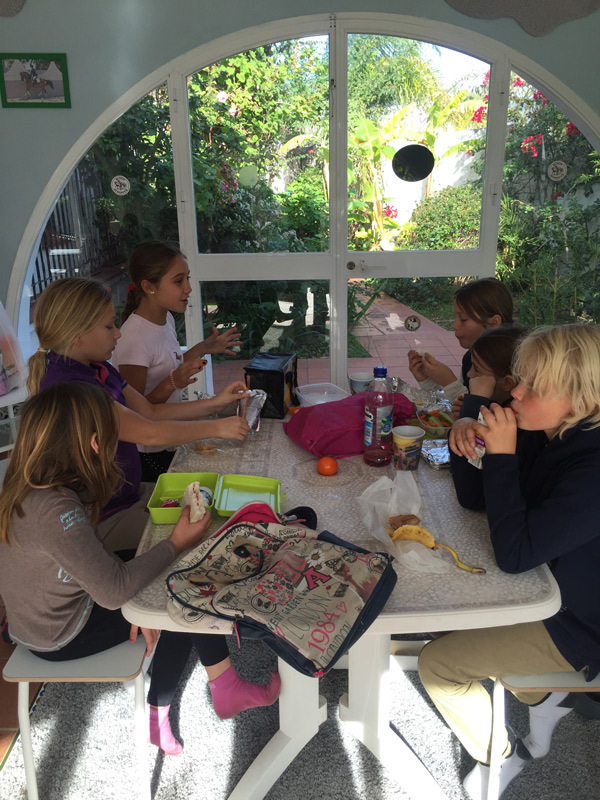 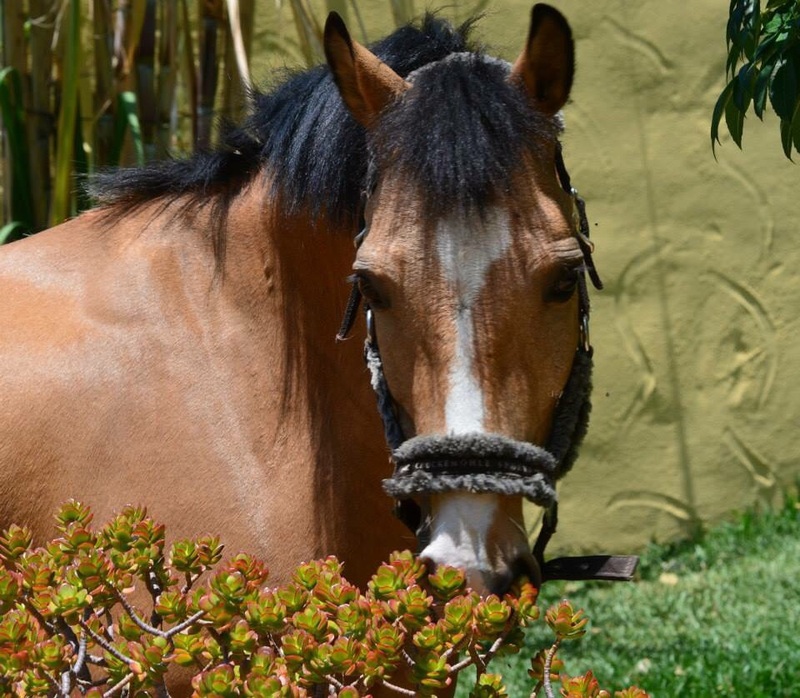 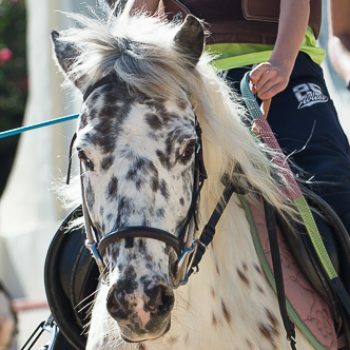 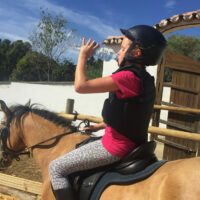 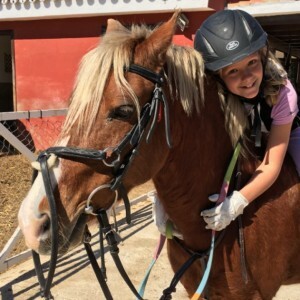 Pony Club Villacana is more than just an Equestrian Centre. 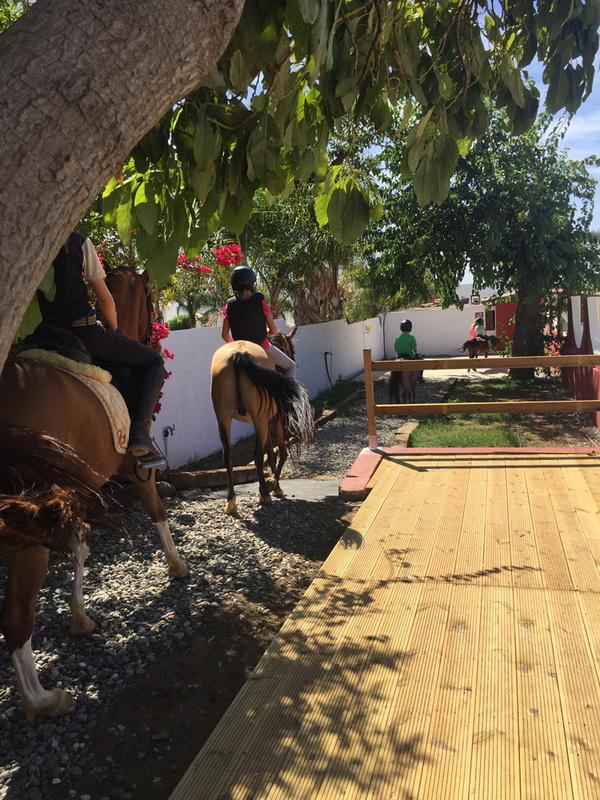 It is also a yard full of real life that is well worth visiting. 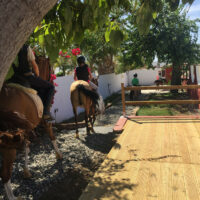 As you enter the main gate, nature unfolds, giving way to the amazing greenery and complete tranquility in spite of its proximity to the highway. 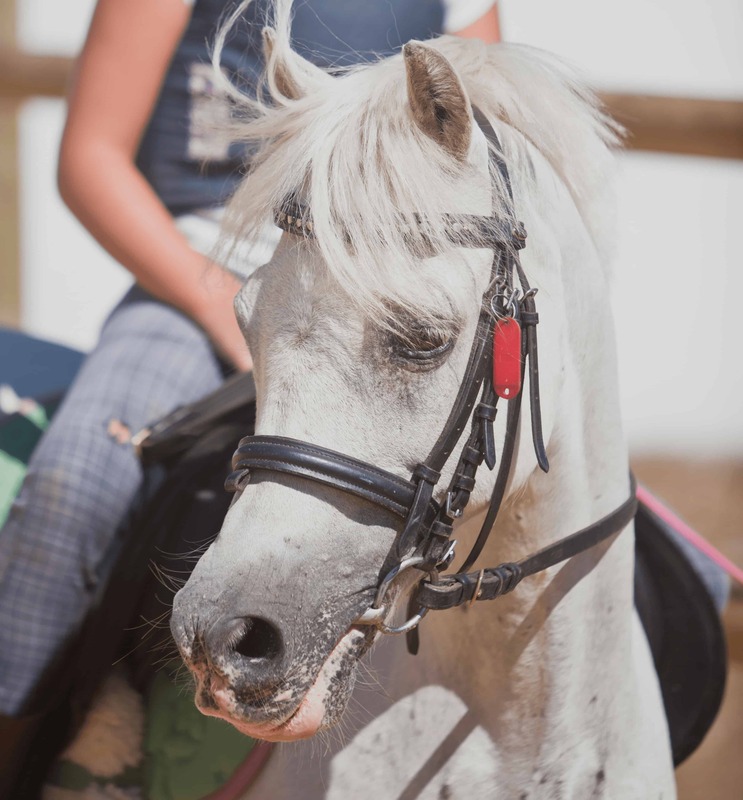 Once on the yard you find yourself surrounded by horses that occupy our beautifully quaint rustic stables and our ponies that stroll freely in the paddocks. 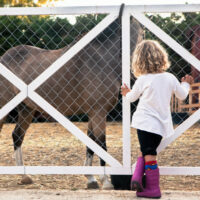 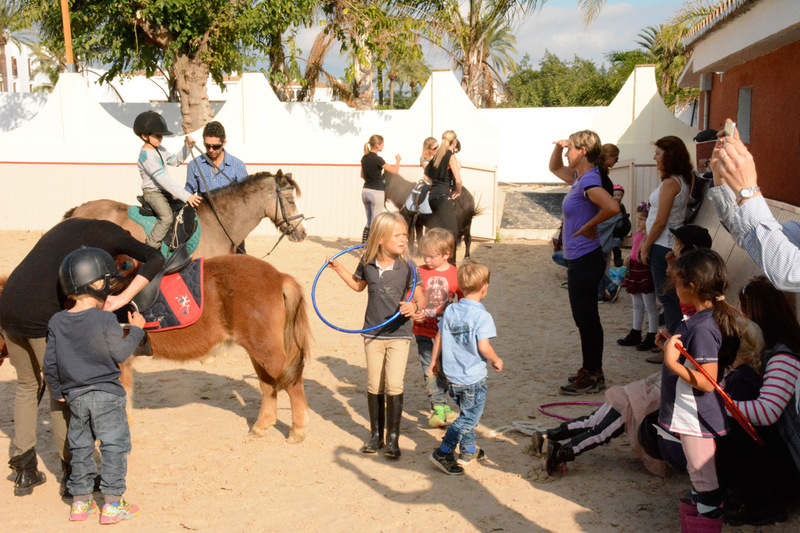 Our schooling arenas, organic vegetable garden and henhouse are some of the highlights of our facilities. 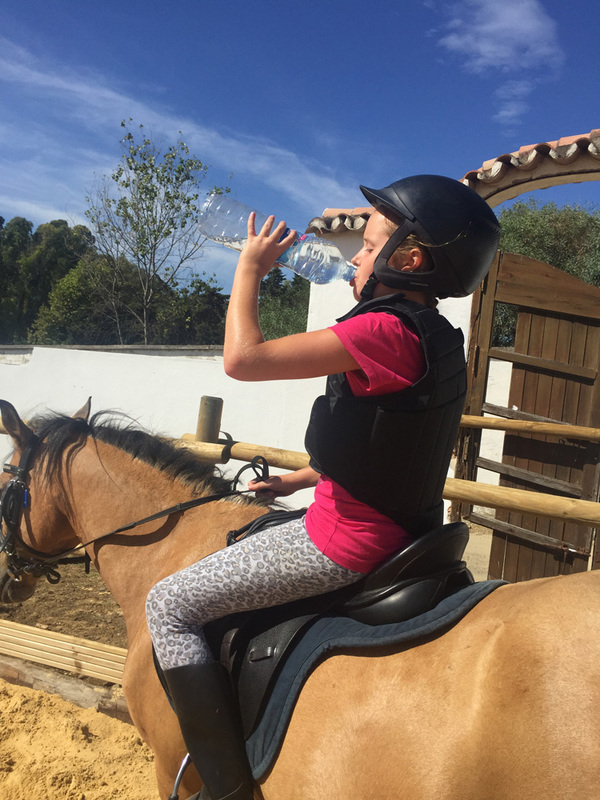 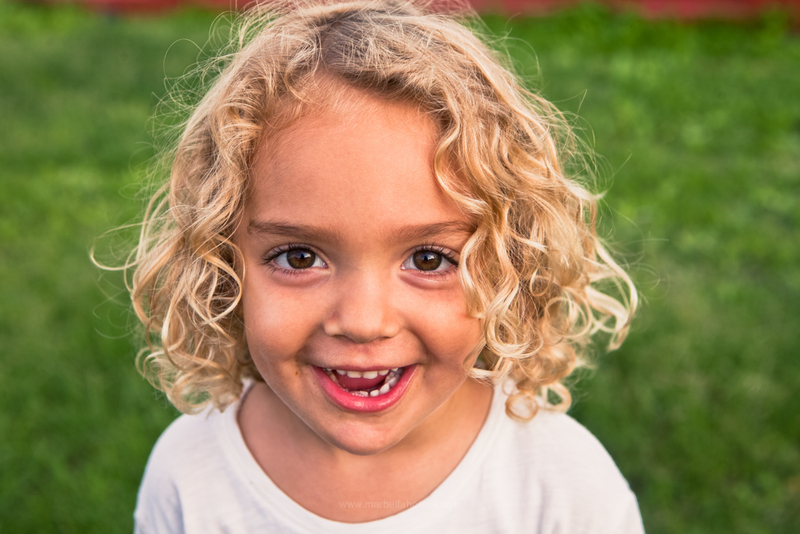 To make the experience exciting and enjoyable, we divide the children into three different alternating groups according to our three independent activity sections that we offer. 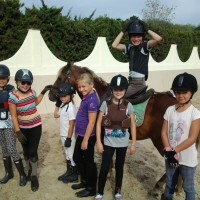 Each of these sections will be led and supervised by responsible and highly qualified professionals. 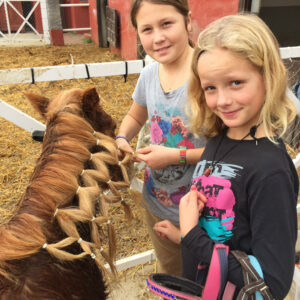 Handling and Care of ponies and horses: Grooming and care related tasks, handling the animal, getting to know the equipment ,tacking up before riding, as well as some basic Equine science . 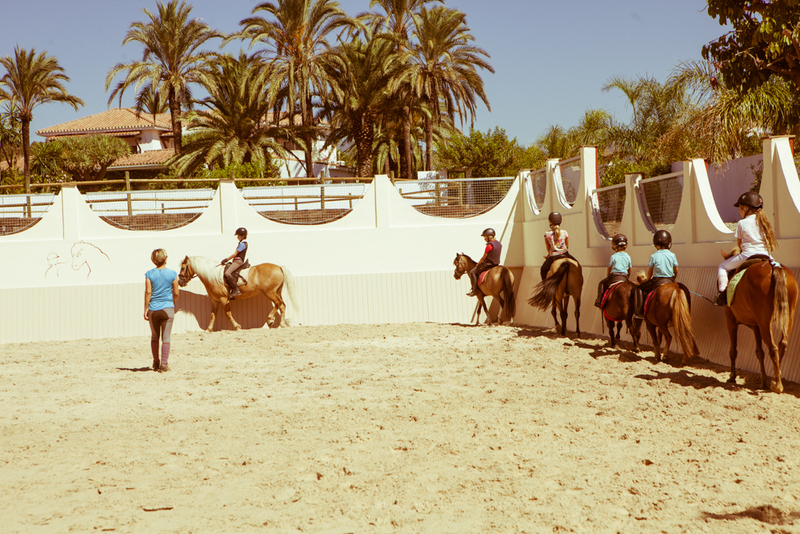 Horse riding: Where the Basic riding skills are acquired . 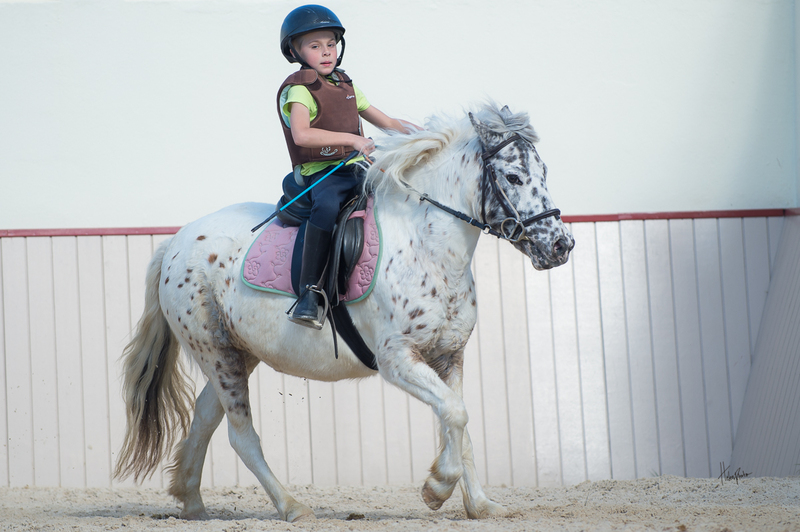 To be able to mount and dismount correctly, improve the riders position and apply basic technical knowledge for safe horse riding. 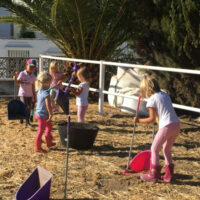 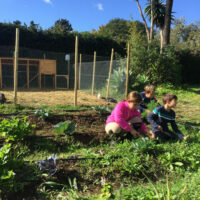 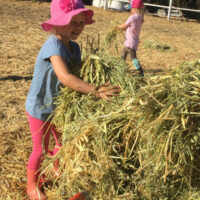 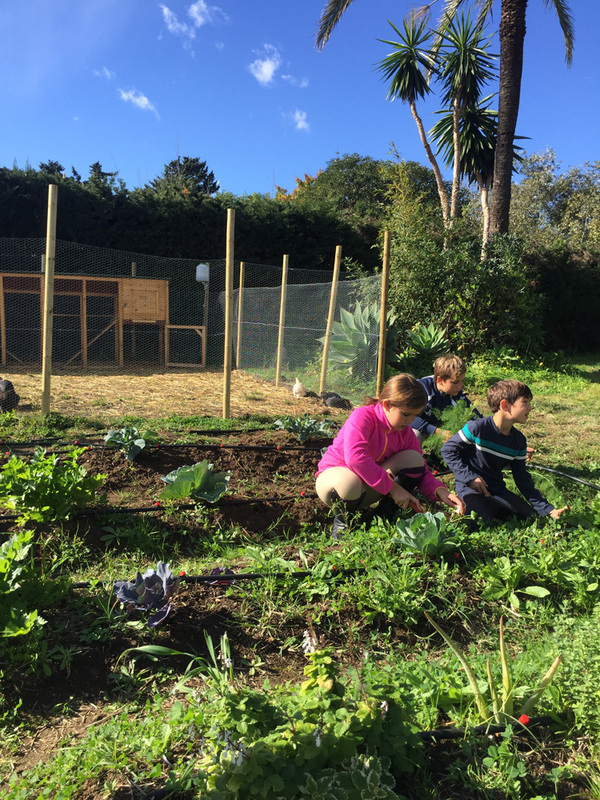 Workshops: taking part in the daily maintenance of our organic vegetable garden and caring for our small farm animals. 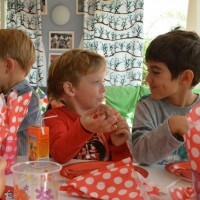 This interaction has great benefits for children at all stages. 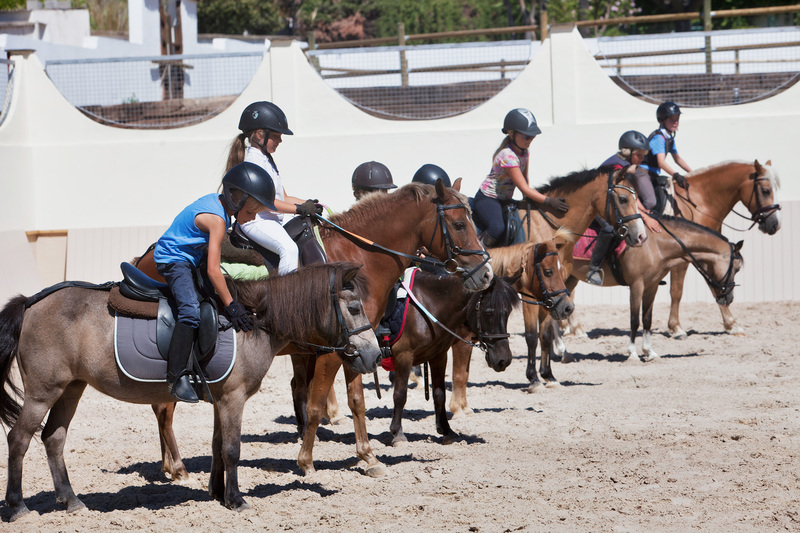 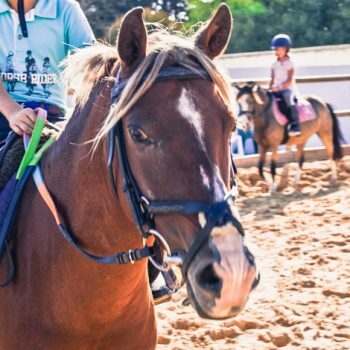 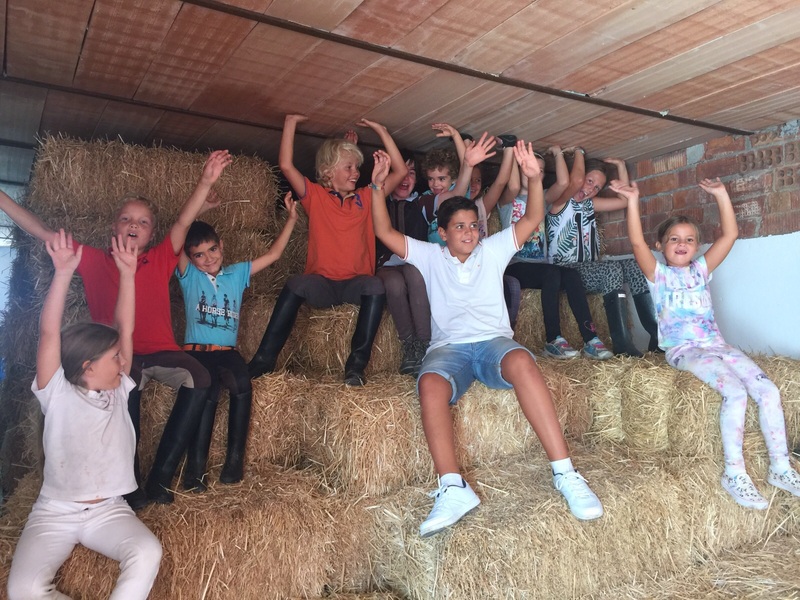 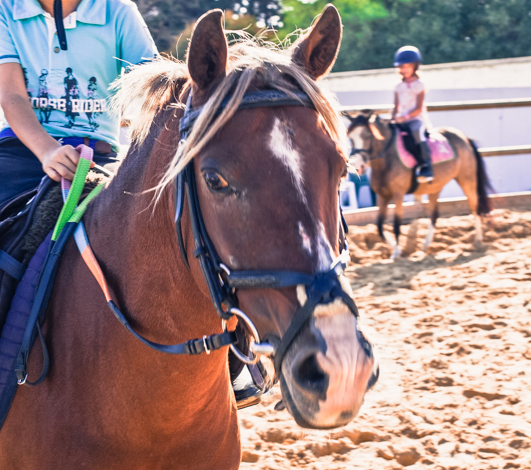 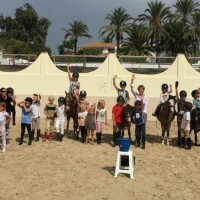 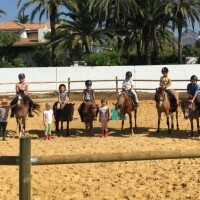 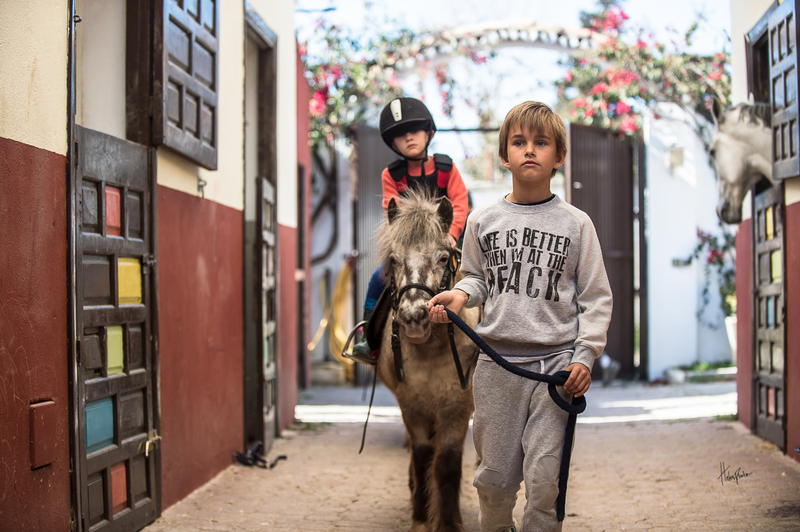 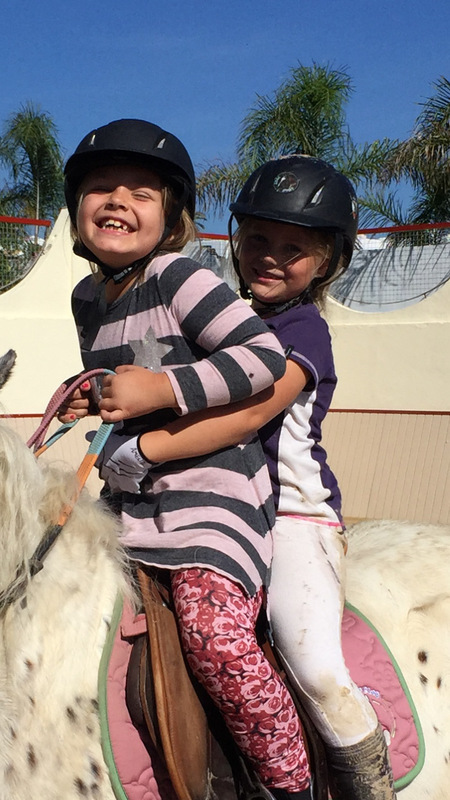 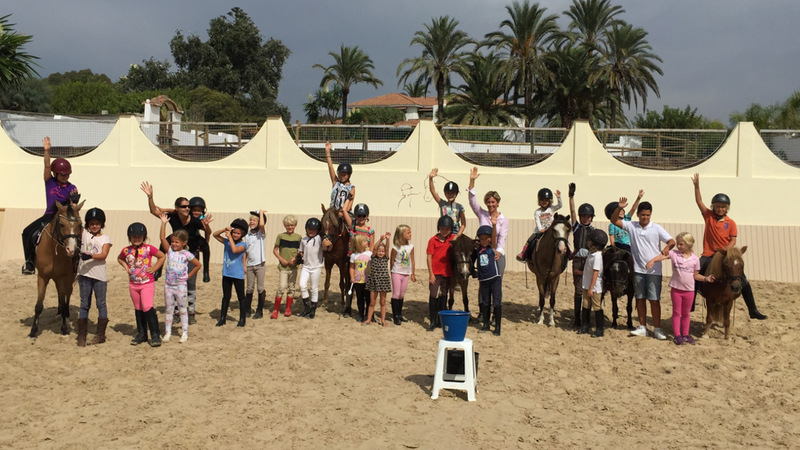 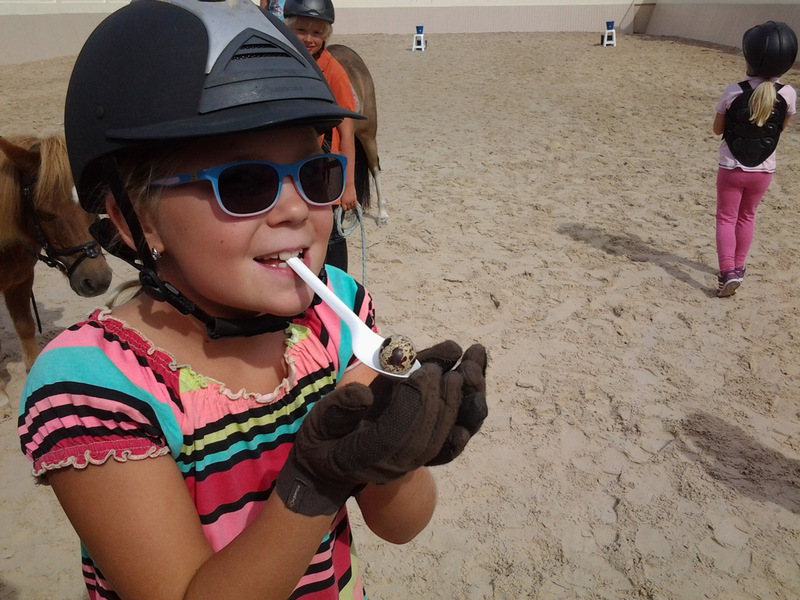 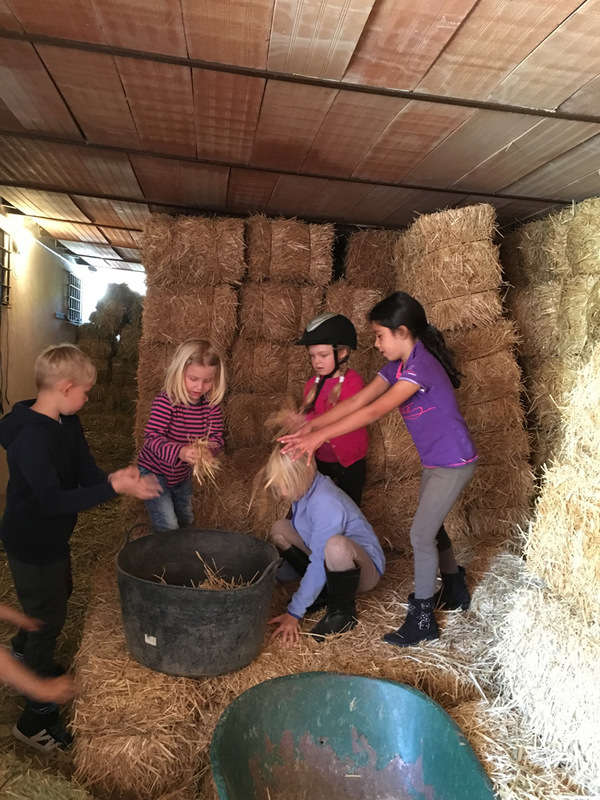 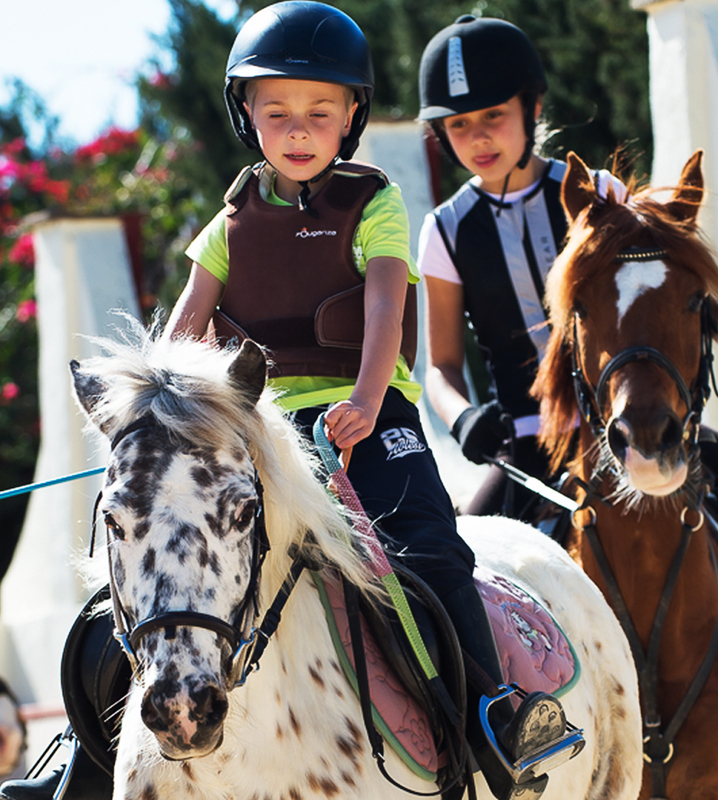 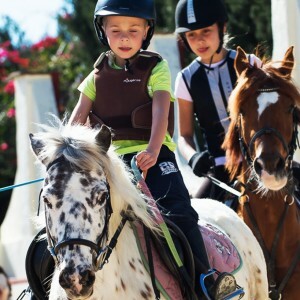 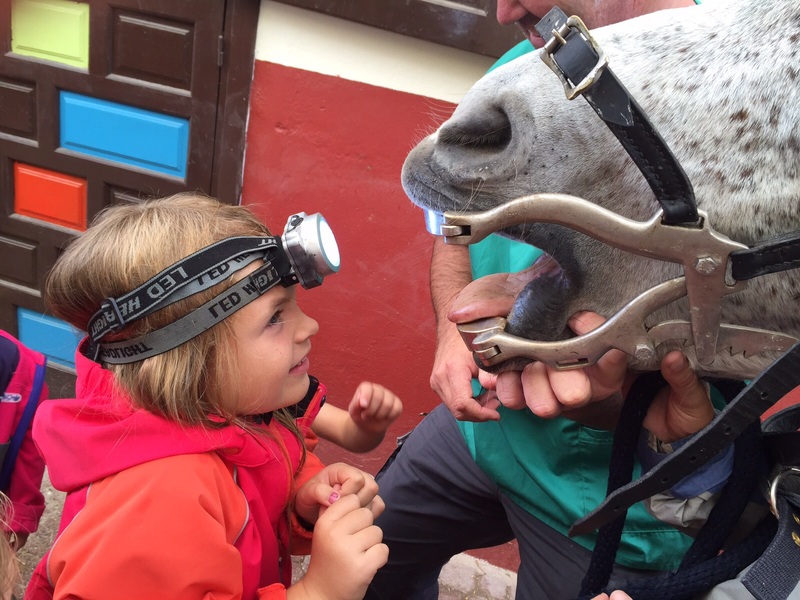 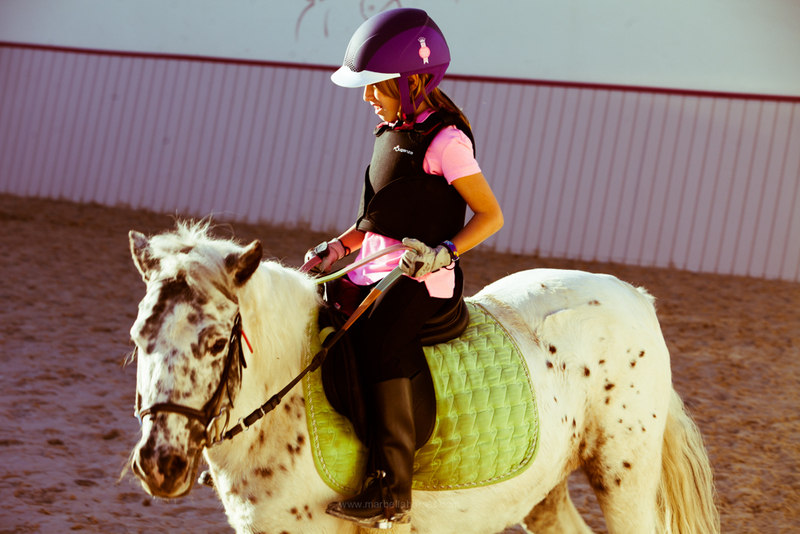 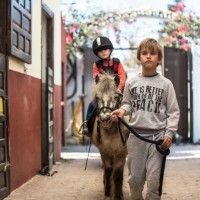 Pony Club Villacana aims to encourage children to participate in these activities that are now within their reach. 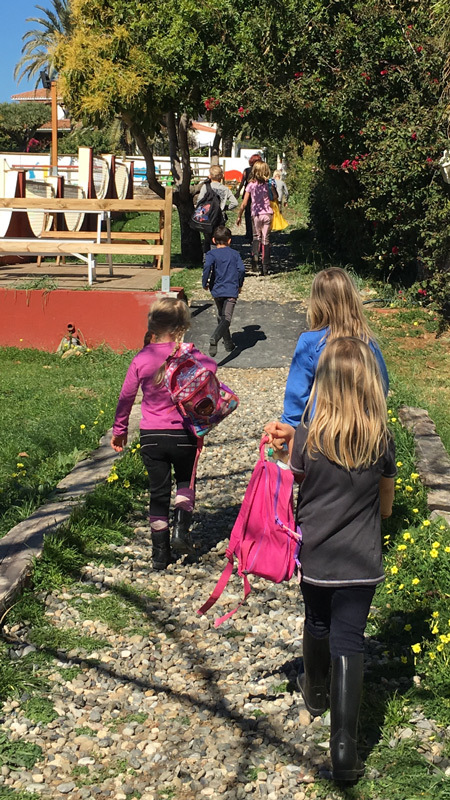 Our Center has an excellent team of teachers, highly qualified for the development of the different subjects and with a wide experience in teaching. 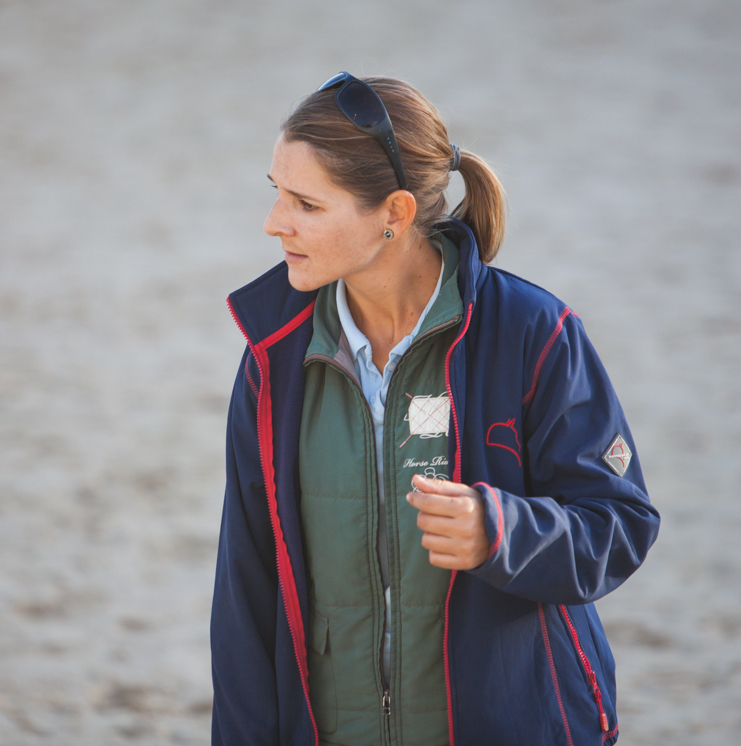 Teresa Cortés Akerman, professional competitive dressage rider with an Instructor & Stable Management qualification by the British Horse Society, who has many years experience working in different Equestrian Centres and Pony Clubs. 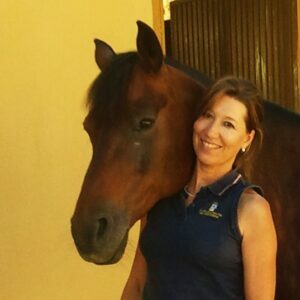 Diana Cotilla, qualified riding teacher by the Superior Council of Sports as a Senior Technician in Horse Riding, Natural Environment Physical activities, Equestrian Therapies and is an official examiner by the Royal Spanish Equestrian Federation. 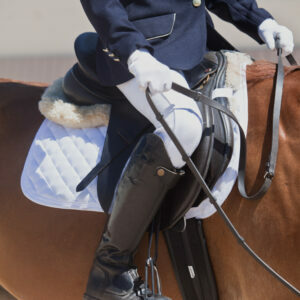 Andrea Koegele is of German nationality . 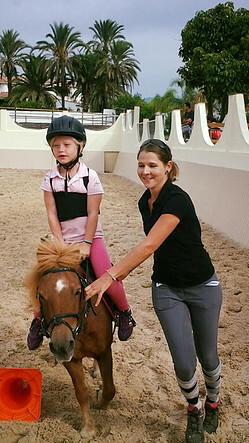 She studied Social Education at the University of Reutlingen-Ludwigsburg (Germany). 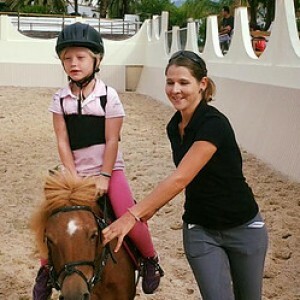 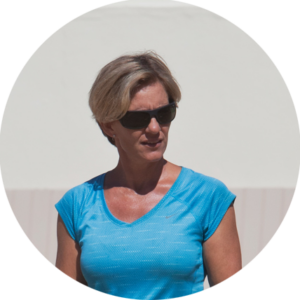 Andrea is also a qualified riding teacher and has received several diplomas in Equestrian Therapies and Horse-assisted Coaching. 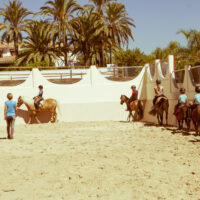 Additionally, she has vast experience as an Equestrian Tourist Guide. 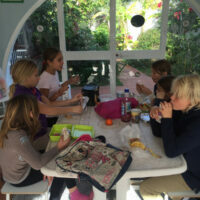 Languages: German, English, Spanish and French. 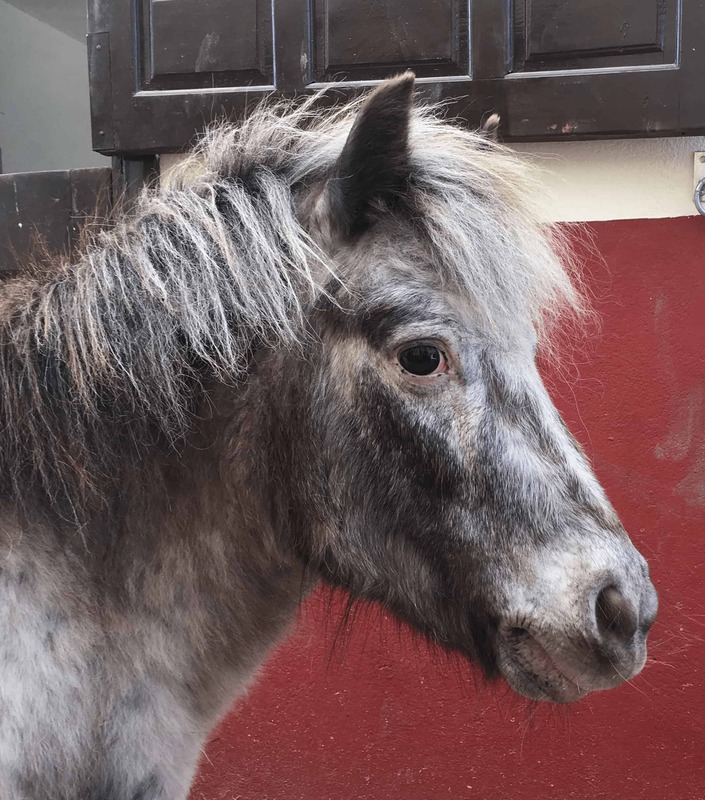 “Jazzy” is our “naughtiest” pony as he’s such a brilliant escape artist. He’s a German pony of very good origins. 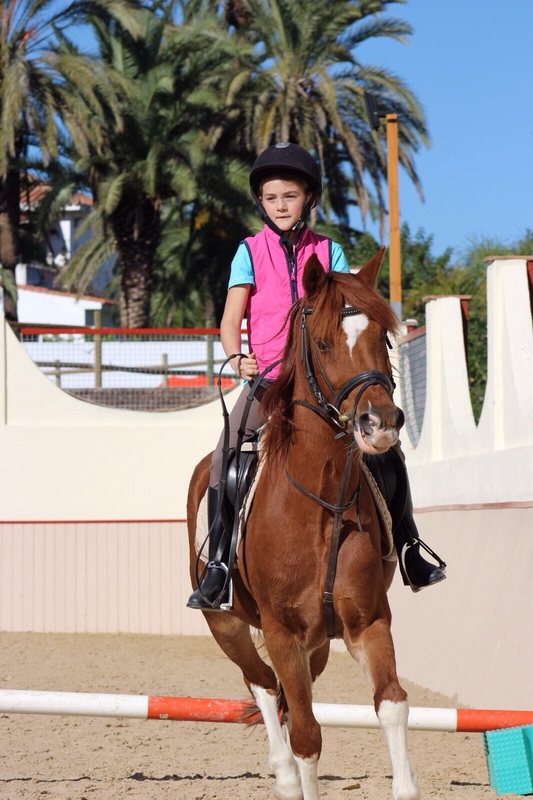 Jazzy has been very well trained and has also participated in important jumping competitions over in Germany. He’s the perfect pony to help you with more advanced exercises. 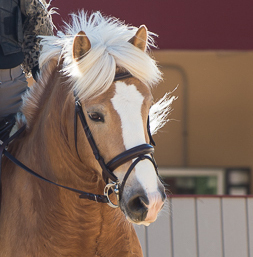 A beautiful and strong pony , typical of the Austrian Haflinger breed. 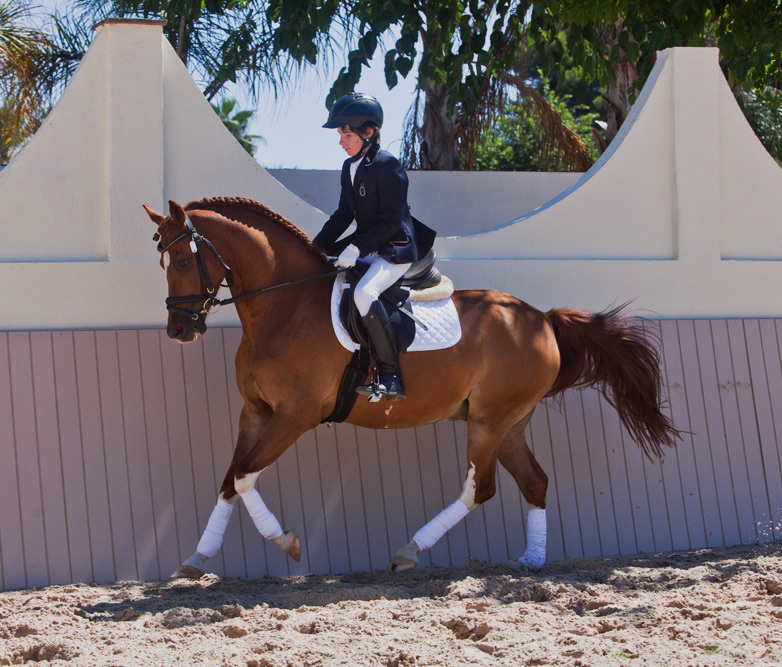 Born in 2009, he has very good qualities for dressage. 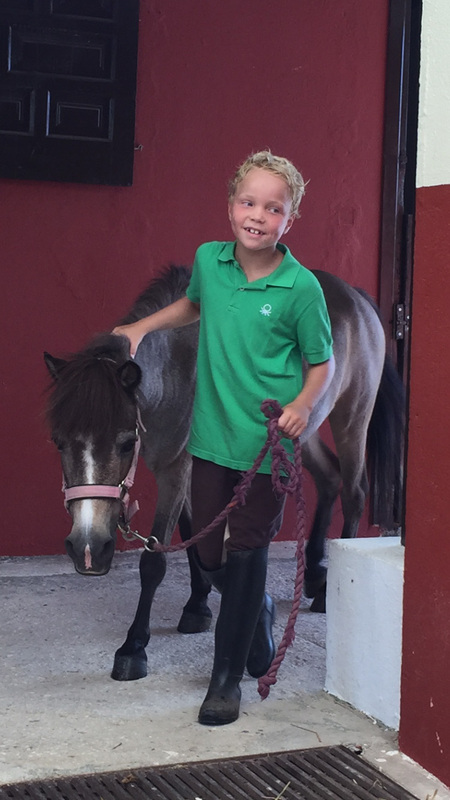 Pegaso is one of the most popular ponies in our Pony Club, due to his unique charm. 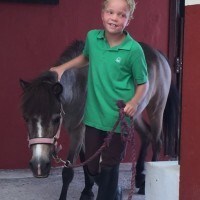 He has also been trained to work in harness and pull a cart. 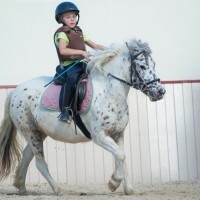 Pascali is our lovely appaloosa cob and is another very popular pony. 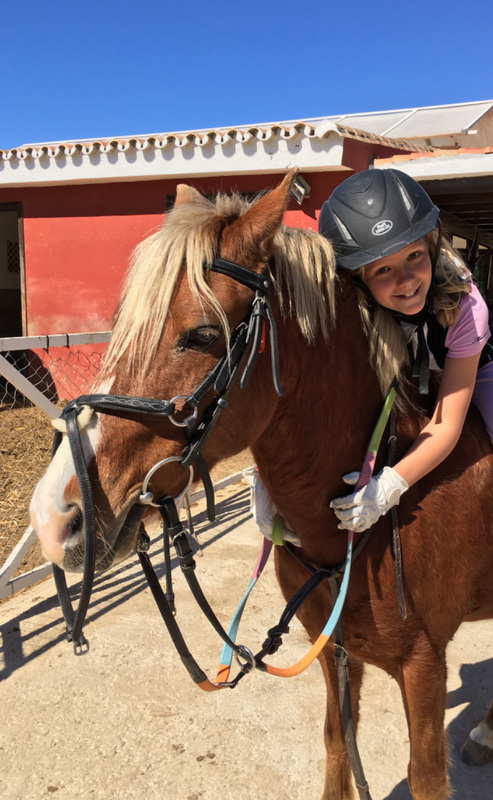 Her easy going character and manageability make her an extraordinary pony to help build confidence and give the feeling of security. A very hard-working pony that is still young but once you take the time to understand him he will give you his all. 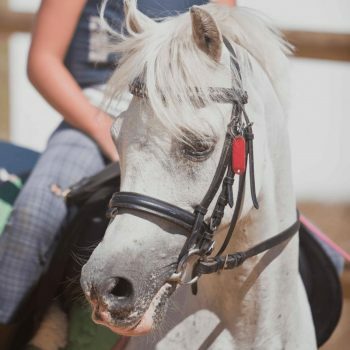 Dandy is very beautiful and is always eager to teach the children sensitivity and accuracy during the riding lessons. 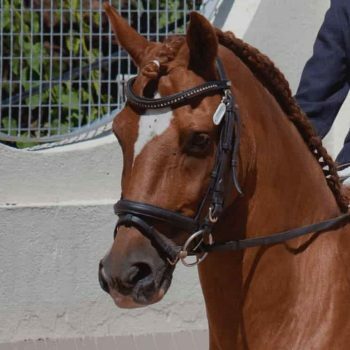 Our teddy bear Shetland has been champion of Cataluña ( Barcelona) several times in his category. 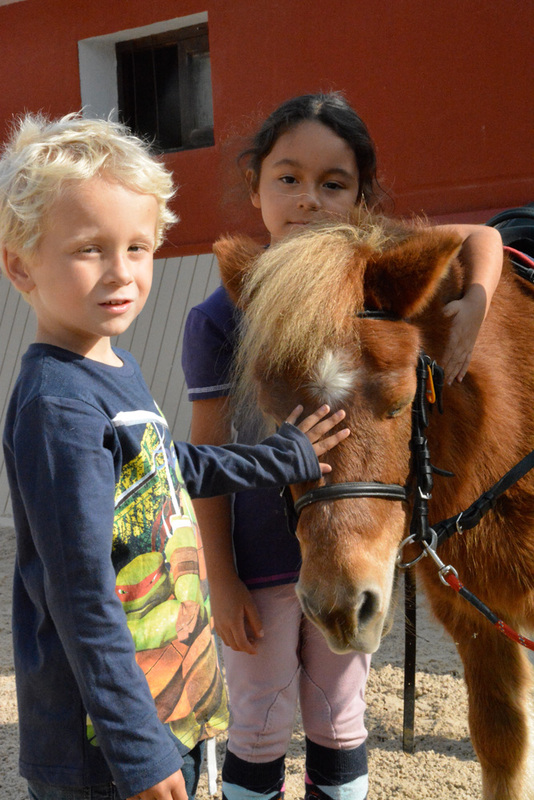 He is very cheerful with children and his beautifully long thick coat makes him stand out from the crowd. 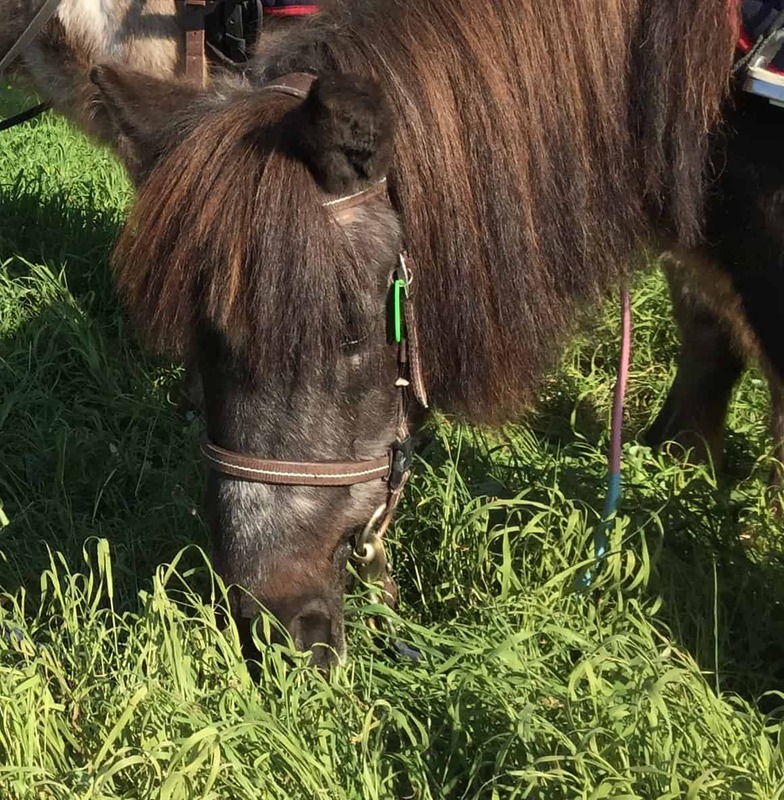 Another one of our excellent purebred Welsh ponies. 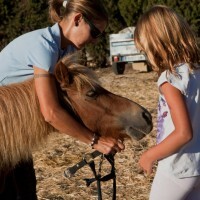 She is very kind and gentle with children, although she is still young and can sometimes be a bit playful. 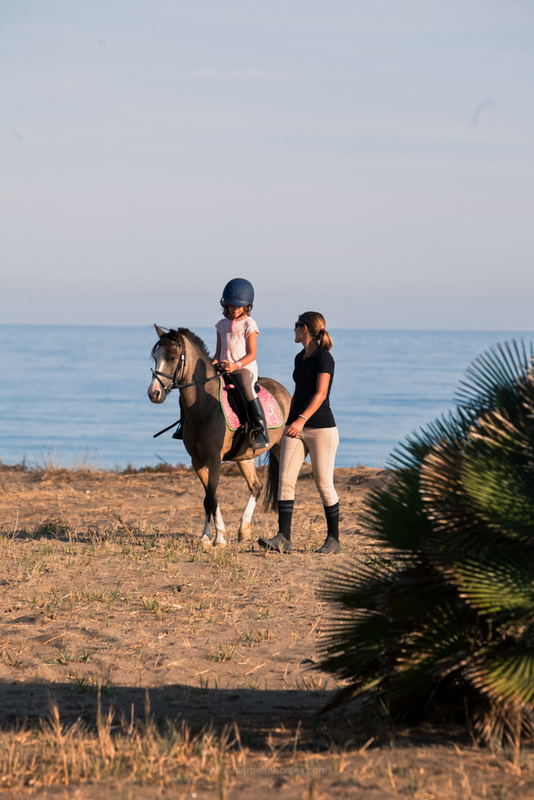 She loves galloping on the beach and is great fun to ride. 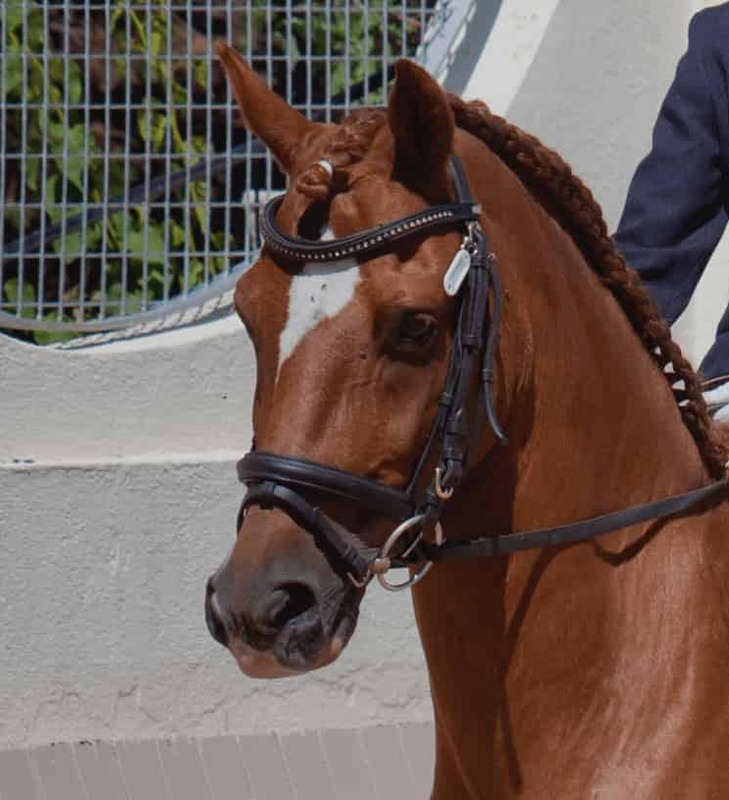 A German pony that has experience competing at national level and has also participated in the Spanish Dressage Championship for Young Riders several times obtaining very good results. 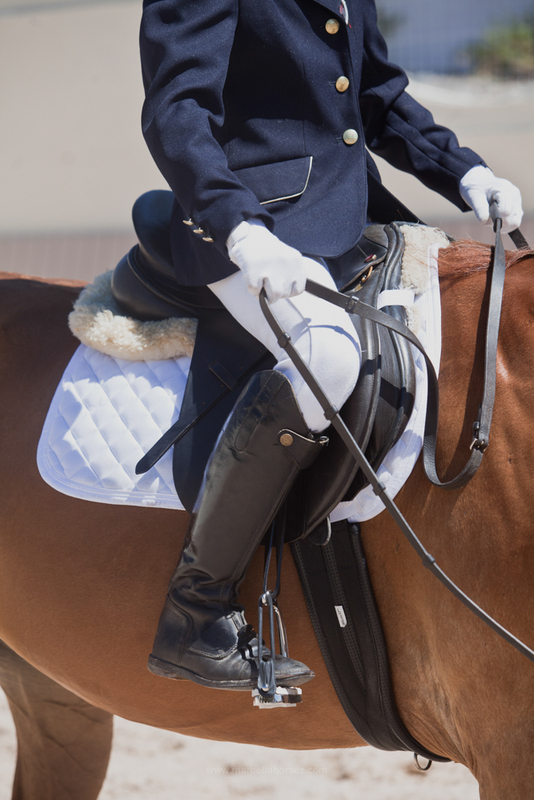 He has a very good character and easily adapts to the level of the rider. 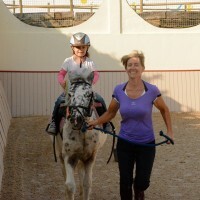 A real four wheel drive who enjoys her work as much as rides out in the fields. 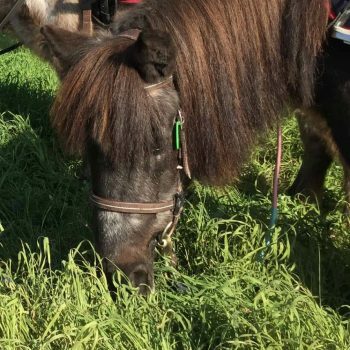 She is known as the dominant one when surrounded by the rest of the Shetlands and Although she was a bit mischievous at the begin she has now become calm and loving with children. 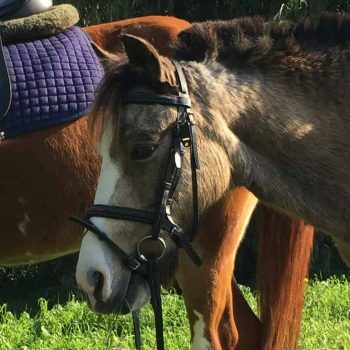 She was rescued from a holding facility almost a year ago. 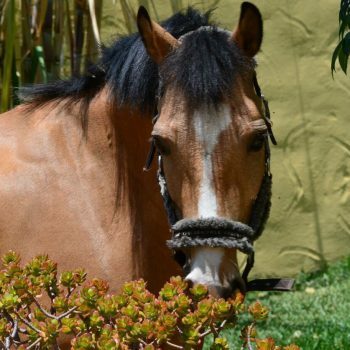 Due to her ill health she received the name “Esperanza” (Hope), which clearly reflected her reality at the time. 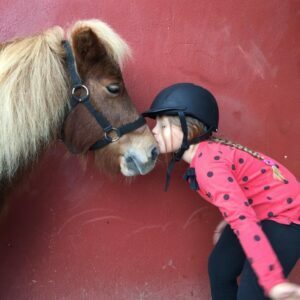 Our little old lady returned to life becoming a sweet and charming pony with children who, at the same time, treat her with love and care. 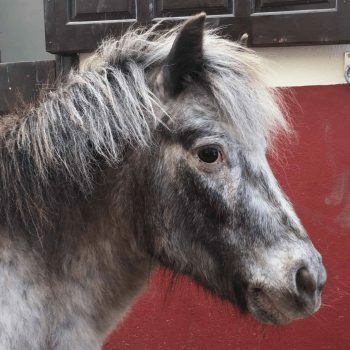 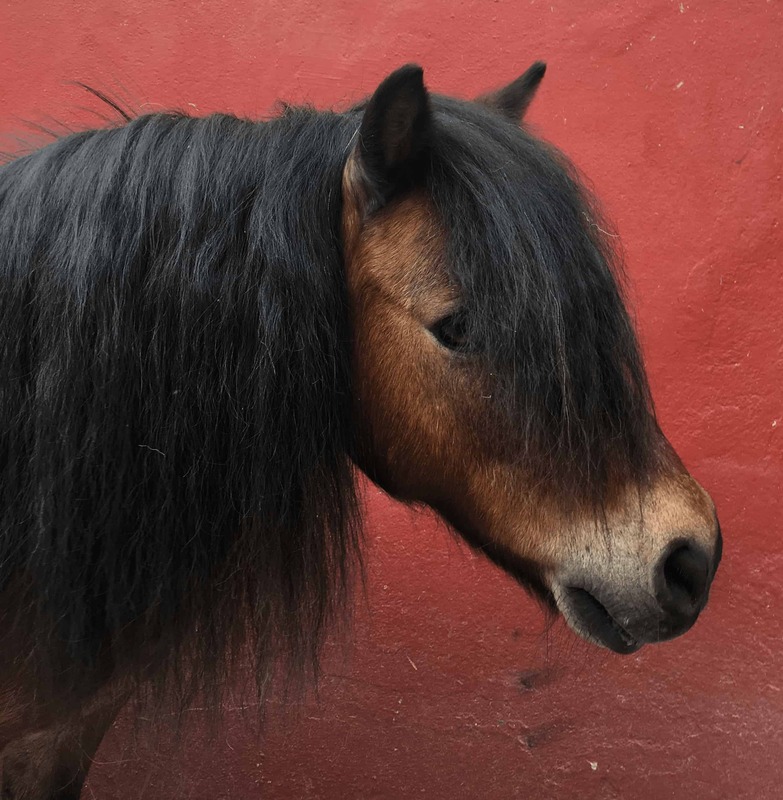 A stunning Shetland with a long and beautiful mane and tail who has become our little “gentleman”. 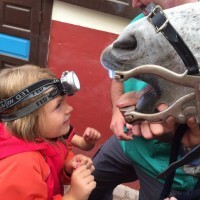 He is very polite and attentive to the children. 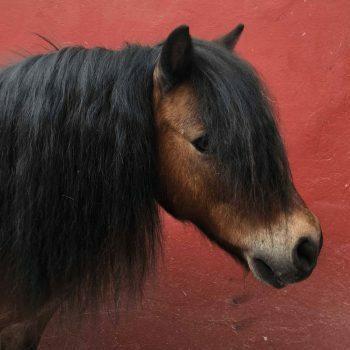 He is a typical Welsh pony like the ones found in horse breed books. 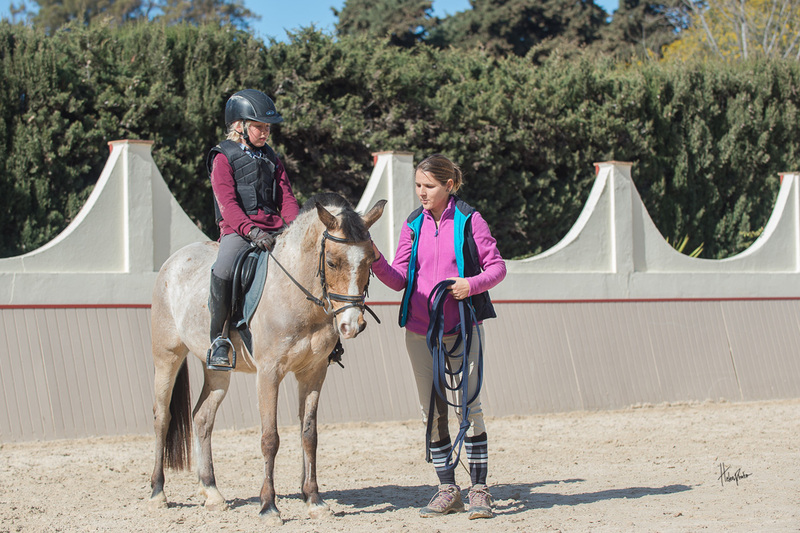 Chuche is very intelligent and as an adult pony, knows exactly how to interpret the rider. 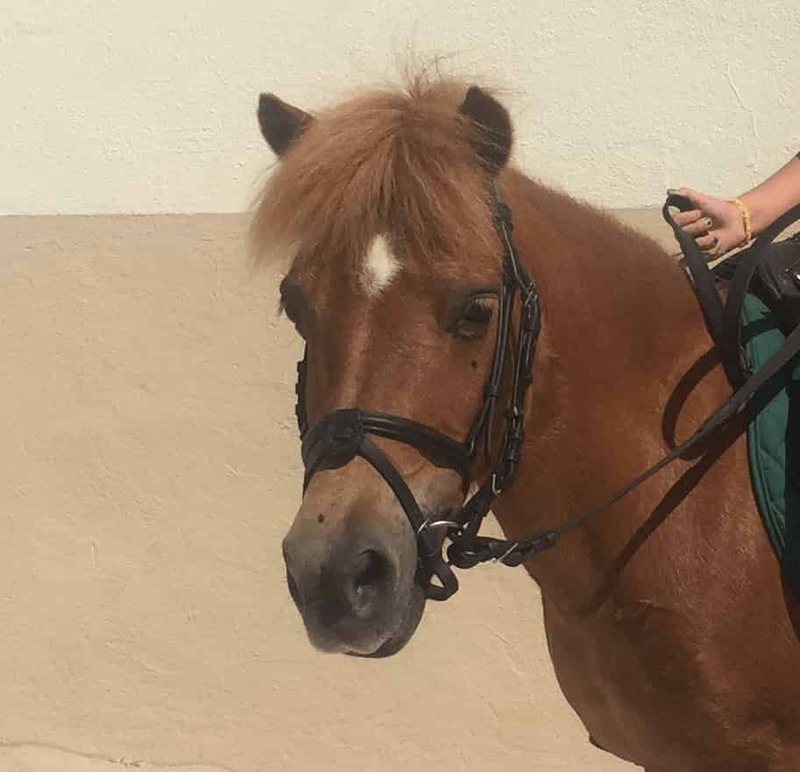 He also has three good quality gaits and gives you the feeing that your riding a big horse !